We have these three dogs that come on to our property almost everyday trying to eat our chickens. Ayub said we're allowed to kill them when we see them. 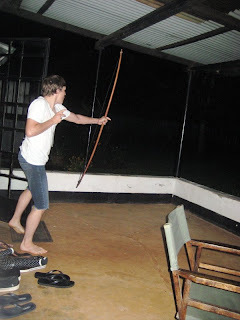 This is Chris shooting that dig with a bow and arrow he pulled off the living room wall...it was awesome. 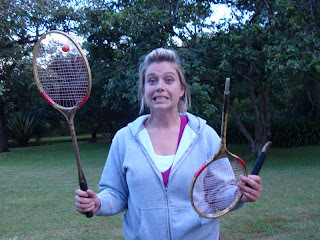 We went back to Dan and Meredith's for dinner and played a quick game of badminton. Within the first few swings, I broke a racket...then about three minutes later, I swung, looked around and could not find the shuttlecock...turns out, it was stuck in the racket. Ridiculous...So I stepped out of the game to swing while everyone else played...it was just easier that way. You are a total JOCK!